Palm Beach known locally as ‘Palmy’ is located at the most northerly tip of the peninsula in Barrenjoey Road which loops the shoreline and approximately 41 kilometres north of the Sydney CBD, by bus or car. 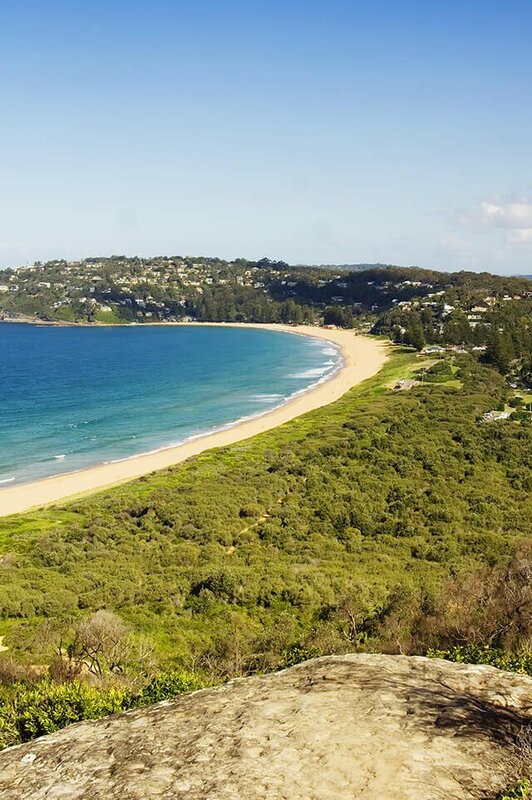 Palm beach is legendary for the fictional town of Summer Bay in the Home and Away TV series. The iconic Barrenjoey Lighthouse, which is still operational sits above the headland, looking west over the tranquil waters of Pittwater and to the east across the Pacific Ocean. The lighthouse walk has some of the most spectacular views the coastline has to offer while the beach curves around down to the southernmost point commonly known as ‘kiddies corner’ for that exact reason. Palm Beach is a laid back, beachy suburb with its own Golf Course and traditional RSL. It has limited shops with locals making the daily 10 minute trip to Avalon for any necessary provisions. Home to some incredible cliff top properties that range from sandstone cottages to prestige properties owned by some of Australia’s most wealthy, it’s no wonder many of Sydney’s A-listers and international celebrities can be found holidaying here. With an established older community of downsizers, retirees, mature families or simply casual visitors, Palm Beach is as much a weekend getaway as it is a place to live. Palm Beach is within a 25-minute drive to the local Mona Vale Hospital and a one-hour bus ride to a selection of Sydney’s Universities in the CBD. The government school catchment zones are Avalon Public School and the secondary option is Barrenjoey High School. Do you need a Buyer’s Agent who can assist you to purchase a property in Palm Beach?